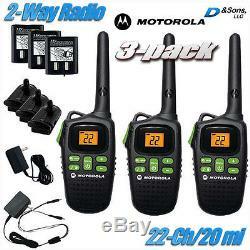 Motorola Talkabout® 22-Channel 20-Mile FRS/GMRS 2-Way Radio Walkie Talkies (3-Pack kit). He new Motorola Talkabout® Walkie-Talkie value pack comes equipped with (3) FRS/GMRS radios, (1) Y-plug dual charger (charges two radios at a time), (1) standard single power plug charger, (3) belt clips, and (3) NiMH rechargeable batteries. These radios are a must-have communications tool for every outdoor enthusiast and perfect virtually for any other applicable application. With a range of up to 20 miles, it's suitable for family and friends, to colleagues or co-workers to stay in touch whether from hitting a back country trail to surfing a crowded shopping mall. The lightweight sets have exceptional range and come packed with essential features. Brand new in Brown Box Retail Packaging. 22 channels Up to 20-mile range 1,300mAh Talk confirmation tone 10 call tones Keypad lock Keypad tone Scan Emergency preparedness Low battery alert Dual power Battery Meter Eco smart Includes three 2-way radios, 3 NiMH 1,300mAh battery packs, Y charging adapter with 2 connectors, charging cable with single connector & 3 belt clips. Actual range will vary depending on terrain and conditions, and is often less than the maximum possible. Your actual range will be determined by several factors including, but not limited to, terrain, weather conditions, electromagnetic interference and obstructions. FCC license required for some channels. All product Serial #'s are logged and tracked. 50 States (NO PO BOXES, APO/FPO). Peak/Holiday periods are expected increases in volume, and duly we cannot possibly be in direct control or responsible for occurrences such as Severe Weather Delays, Carrier Volume,'Acts of God' etc. There are no exceptions to these policies. In order to process a valid Return request for all return-eligible items, these minimum requirements must be met. All original packaging and accessories manuals, cables, etc. Are intact along with the item. Product exchanges are allowed for equal or greater priced item only. Customer pays difference if higher priced item. By purchasing products from our company, you are asserting acknowledgement agreeing to a legally-binding commerical Business-to-End User/Consumer contractual purchasing agreement. The binding and non-binding parties agree to all the preceding above-stated and as follows below in these Terms of Sale. For purposes of this Agreement, "E-Commerce" means sales of products by D. & Sons, LLCs websites, or any online system or computer network. E-Commerce' also includes any related business and marketing activities supporting such sales. The Term of this Agreement begins on the Effective Date (noted above) and remains valid indefinitely until either: (1) D. & Sons, LLC and said E-commerce platforms and Marketplaces shall be and remain the sole property of D.
Plagiarism, Intellectual Property Theft, or any other forms Trade Dress violations or similar where valid under law is strictly prohibited. SHALL INDEMNIFY, DEFEND, AND HOLD HARMLESS D.
& SONS, LLC TO COMPLY WITH THIS AGREEMENT; (B) NEGLIGENT OR GROSSLY NEGLIGENT ACTION, INACTION, OMISSION OR INTENTIONAL MISCONDUCT OF D. The laws of the State of Colorado and Nevada govern this Agreement and any disputes arising hereunder. Except injunctive or other equitable relief, D.
If mediation is unsuccessful, the parties agree to submit disputes to state or federal court in Denver County, Colorado, USA, and/or Clark County, Nevada, USA. This Agreement constitutes the entire agreement between all prior, above-named parties with respect to the subject matter hereof, and supersedes any and all prior or contemporaneous agreements, understandings, negotiations, representations or proposals or any kind, whether written, oral or otherwise. Neither party has relied upon any statements, representations or other communications that are not contained in this Agreement. Order Online 24 hours a Day, 7 Days a Week, 365 Days a Year. The item "NEW Motorola 22-Channel 20-Mile FRS/GMRS 2/Two-Way Radio Walkie Talkie (3-Pack)" is in sale since Wednesday, January 13, 2016. 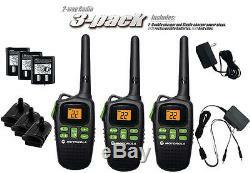 This item is in the category "Consumer Electronics\Radio Communication\Walkie Talkies, Two-Way Radios".llc" and is located in D. This item can be shipped to United States.